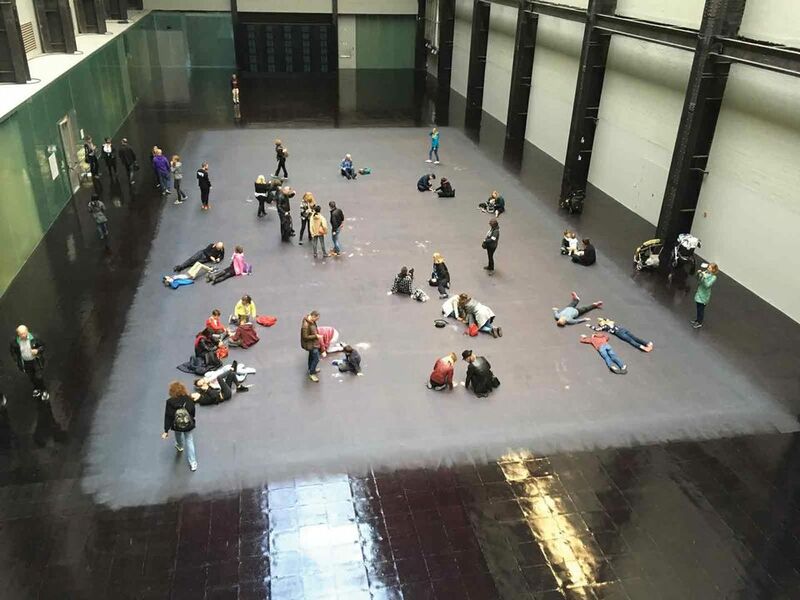 When Catherine Wood, Tate Modern’s curator of international art (performance), offered me the Turbine Hall commission just over a year ago, I felt excited: I always like a challenge. But the next day I thought, “Jesus…” The challenge with this commission is that you have no control over your work. It’s a place where free will is tested. The first month I panicked and had no ideas. The project’s immensity and visibility made me rethink how to communicate an idea to such a broad and diverse group of people. Then I looked at the previous commissions to try to understand what worked. The obvious successes were Olafur Eliasson [2003-04] and Doris Salcedo [2007-08]. Most agree that one powerful image, instead of many little ones, works best. I decided that instead of an image, I would make a gesture—the image would be invisible. Very early on, I met Tate Modern’s director, Frances Morris; we talked openly about the institution and its aspirations, and about how the Tate is an international institution with a local impact. We asked how we wanted the neighbours to feel when invited to the Tate. That conversation triggered the project. With the help of Tate Exchange and Tate Community, we formed Tate Neighbours. The group consists of 21 neighbours, including activists, an 87-year-old neighbour who visited the museum for the first time and two older people who have been coming to the Tate since the beginning, plus some people who are critical of the institution and some who adore it. This is a very varied group of people— you would not imagine them working together, due to their different ages, backgrounds and relationships with the Tate. We asked ourselves what was missing at the Tate for them to feel invited. The resulting piece came, in part, out of their involvement. The whole project is about invisibility. You are confronted with an empty space when you enter, which will be a surprise for what is supposed to be a spectacular commission. Visitors may notice a plaque at the old Boiler House [Tate Modern’s main building] explaining that it has been renamed after Natalie Bell, who has worked with the community’s youth in crisis for more than 25 years. Many of these kids went on to study or work instead of achieving the outcomes predicted for them. This gesture is a conversation about what contribution means, about how we have to rethink our values. The signage on all of Tate Modern’s buildings, and on the elevators, the maps and so on, has been changed to the Natalie Bell Building. It will retain her name for one year. This brings us to the concept of legacy, and the commitment of the institution to its community and a socially driven art project. Part of this commission is that we will be working with Tate Neighbours for the next two years. The project has a civic and a symbolic dimension. At the end of the Turbine Hall is a giant portrait that we covered with thermochromic paint, which changes colour with body heat. The image can only be revealed when many people generate warmth on the floor at the same time. You have to work with people you may not know to “see” the work. It is a portrait of Josef, a young Syrian man who left his home in 2011. He was 18 when he came to the UK after being denied entry to the US. He had no family and no money, and he was homeless. After a few months, he was helped by the SE1 United charity, for which Bell works. The whole idea of the project is that we can only make things happen if we work together. There is also a room where visitors can cry together. I wanted to create forced empathy, to rehearse how we feel about others in times of fake news. In a world with Donald Trump, we need to start feeling together. It’s not my problem or your problem; it’s our problem. We need a culture where “us” and “them” are substituted by “we”.